Let us leave aside the rough-and-tumble excitement of the upcoming elections for a minute, and move back to economic issues, though the subject as hand does not strain much from the field of economic policy. – at a certain point of time, the total size of the GDP couscous grows to a larger size. 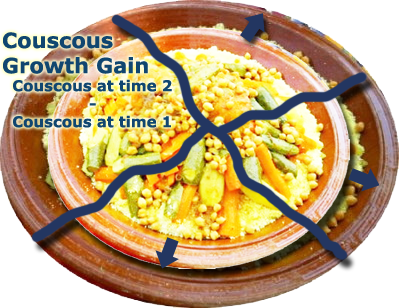 The difference between the initial size of the couscous plate and the present one is obviously, what can be considered growth gain for everyone eating the couscous. But, there is a catch to it: not everyone benefits from this growth. In fact, it is hardly systematic: a larger couscous plate does not necessarily mean a larger share. As a whole the plate has grown, and new individual shares increase in size as a whole, not necessarily so when taken individually. This explains the fallacy of considering the average income/GDP per capita (or average couscous share) as representative of other shares in its dynamics. – the fallacy finds its origin in an extrapolation over national statistics; i.e. that everything is either uniformly distributed across individuals, or that there is a huge concentration around the average -thus rendering extreme ends of very poor or very rich individuals irrelevant. In statistics, these two states are referred to respectively as the Uniform and Gauss-Laplace distributions. In real-life however, especially in Moroccan real-life, these distribution types do not apply. Since 1999, the average Moroccan household have doubled their income. Let us keep up to our Couscous analogy, and assume their couscous share have almost doubled in 10years. This is good news for our average household, since this increase is inflation-free, that is, their increase is in real terms: all components of their couscous share have all doubled by physical measures: pounds of meat, number/pounds of vegetables and pounds of sesame, regardless of monetary value (or price). All is well then, though it is highly unlikely to meet this fortunate “average household”. They don’t exist as such. This is one of these magical tricks where numbers create a reality by themselves: in this case, the average household has been created by simply dividing, every year, the total Gross National Income -or the Big Plate of Couscous- over the adult population -or the total number of hosts gathered around the big plate. It is a convenient estimate to have a certain idea of what each guest would get in terms of couscous share. It does not, however, tell much about how the big plate of couscous is divided across the guests, and this is a problem. Why so? let us consider a simple example: suppose there is one particular guest who systematically get a larger share of couscous. The other guests cannot do otherwise but accept that particular guest gets a larger share, and sometimes accept that other particular guests get more and more. But remember, the average share per guest has double over time; someone needs to sacrifice their potential gain and settle for a smaller than expected; in fact, they might even settle for a smaller than expected share in absolute terms. The First Guest has got served. Generously. 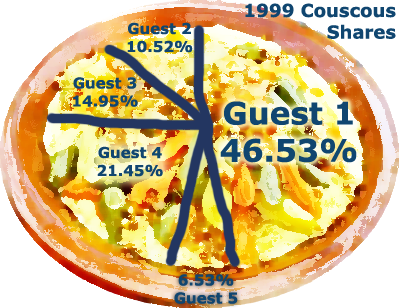 Let us start over: in 1999; there were 5 guests poised to share the couscous plate.These guests have different degrees of importance: Guest 1 is wealthy, important and powerful. Guest 2 is less so, but nonetheless has a good standing, and can still claim a large share, and so on and so forth. Guest 5 finds themselves almost thrown away from the feast: they have only 6.53% of the big Couscous plate. A decade later however, the same guests decide to feast again, this time on a bigger couscous plate, because in the meantime they can afford to. And so they went, in 2009, to meet up and eat from the big couscous plate. These guests, as one might guess, are ranked households per respective income, and then gathered into groups of 20%, or quintiles. And the couscous, of course, is total GNI. Yes, the richest 20% captured almost half of GNI in 1999, while the poorest 20% could afford only 6.53% of the national income, and 10 years later, the richest increased their share to the expenses of almost everyone else. But hold on! the relative share might have shrunk, but that does not mean the other guests will not get a larger share with respect to what they have got in 1999. And indeed it did: the third guest -the one who leaves an equal number of guests to their left and right in terms of wealth and importance- have had their income increase from MAD 57,000 in 1999 to MAD 64,000 in 2009. Sadly, these are only monetary values. In order to go back to our couscous analogy, we need to take out the effect of inflation, that is, the increase in the price of meat, sesame, vegetables and services around providing the plate of couscous. When these are eliminated, the actual share, even by physical measures, have decreased. The Couscous analogy tells us the following: it is a fallacy to consider average as representatives when it comes to incomes and households in Morocco. There are great disparities and these have been dangerously widening; we are catching up pretty fast with one of the most unequal societies on earth: the United States. Our Gini Index has been computed by the HCP to 0.46 in 2009.The United States stand at 0.56; We have been catching faster in inequality, than we have been able to do in terms of output creation. I am -of course- referring to the cut-throat competition for candidates to get party endorsements to run for office in a particular district. Things get even murkier with pre-electoral elections, when some parties need to give way to other parties, so that the chaps leading the coalition get a larger caucus, and thus can properly claim government leadership. It seems some strong-arming is going on with A8 “Alliance for Democracy” candidates, some of them being pushed to make way for the now officially leader, RNI party. – 30 seats for Youth ballot; it is worth mentioning that Art.23 puts restrictions on the Youth ballot by only allowing male candidates less than 40 years-old. So, unless A8 Alliance guarantees a clear win with 153 seats locally carried with at least 50 seats in both national ballots to secure a smooth confirmation. The have to tighten their grip on these ballots by presenting strong candidacies, because national ballot seats are not cumulative with respect to the alliance’s result, but the performance of A8 individual components. 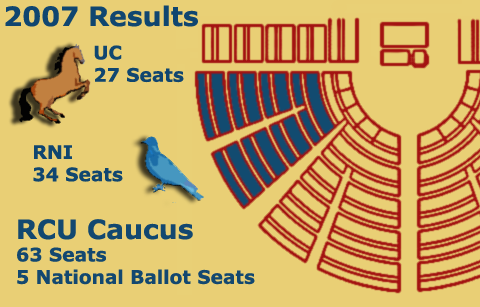 There is a simple example to illustrate the paradox: RCU (RNI-UC) Women’s caucus is 5-members strong, that is a projected 16.7% of all 30 national Women ballot seats. But their 63 seats-strong locally elected caucus gathers 21.35% of all 295 local seats; the discrepancy has mainly to do with the nature of their post-electoral alliance there are some districts where RNI and UC candidates were up against one another, and the loser was strong enough to take away crucial votes from the winner, this weakening its majority, and so lowering likelihoods for the party’s winner to get enough votes and “push” for an additional seat on the national ballot. 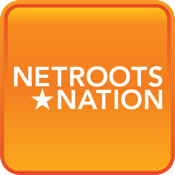 Rep. Zerkdi is just -as he puts it– the collateral damage of RNI‘s eagerness to reach the top; And the precise measure of how much RNI needs to win in terms of both local seats and national ballots can be more or less estimated with respect to the most obvious competitors’ showing; PJD can carry at most 60 seats (computed on the basis of 2007 elections results where the party managed to scrape more than 25% outright) and the only way to beat PJD to the top is obviously to deliver 65 seats at least. And so, RNI is gunning for those districts they couldn’t carry in 2007: Taounate, Tangiers, Taroudant, Tan-Tan are safe bets, while decent results have been carried in Guelmim, Agadir, El-Jadida and Jerada, to name a few (these districts have voted, on average, 8 to 12% for RNI candidates) the strategy, it seems, is therefore to gain 30-ish seats -thus increasing their share in total caucus to 86 seats. The way I see it, MP, UC, PAM and the other smaller parties need to carry no less than 100 seats by themselves to deliver the workable majority of 200 seats. Game results, RNI beats PJD as leader party with 64-65 seats, and has the advantage of already bringing an electoral alliance together, a significant advantage, if PJD still manages to pull together a last-minute alliance with Istiqlal, USFP, PPS and a handful of other parties. G8 Parties are holding a press conference at the moment it seems; they will, according to Minister Belkhayat, unveil their electoral manifesto Tuesday or Wednesday next week. Stay tuned. Two days ago, political Talk-show “Nou9at 3alal 7orouf” (“dotting the i’s”) hosted a strange performance, with outgoing finance minister Salaheddine Mezouar and likely next head of government putting on a show to display his supposedly naked charisma and to collect good marks as an outstanding public speaker. Correct me if I am wrong, but his performance lacked proper preparation, or his spin doctors (if he has any) figured out just right how to go to the earth of the Silent Majority of Moroccan voters. By the way, M. Mezouar and many of the other guests did not seem to know much about basic fiscal and economic policy principles, or even worse, the history of their respective parties. Again, I can’t make much out of it, whether their incompetence was guileless or belies some cunning, ruthless political skills. 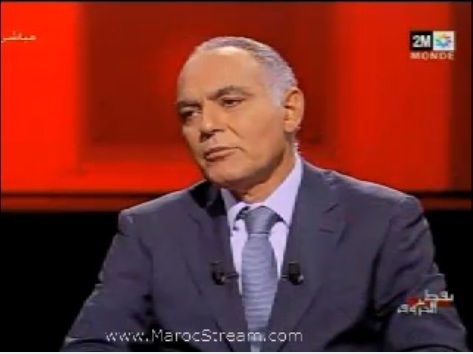 What was clear, however, was M. Mezouar’s eagerness to be the next Head of Government – whatever it takes. On taxes and debt, the Minister was very evasive, though he did hint to what I already suspected to be the case: piling on the debt and increasing borrowings are paying up for his tax cuts and loopholes; He only hinted to it, so he did not have to justify it, nor did he need to burnish his so-called economic competence skills; Quite the opposite, he persisted in claiming his tax cuts have generated much positive externalities, boasting his record in sustaining Morocco’s GDP growth during the credit crunch and the 2009 global recession to 4.9% (very close to the potential economy growth) when global GDP plummeted -2.04%. He was belittled the potential danger of piling debt to MAD 398Bn, perhaps because he is betting on a robust growth that would outpace borrowings and thus somehow allay its burden on the economy. But the show was not about his record at the Ministry. That was road-test leadership bid for the next election; this explains why his message was a motley of sub-signals to various interest groups, especially to the “progressist-modernist” spectrum; he has consistently dropped in not-so-subtle hints that, as a leader of an 8 parties-strong coalition, he will not compromise with moderate Islamist PJD party, basically attacking them over their double-talk on women’s rights and gender equality. and that was a clear rejection of PJD. My impression was that Salaheddine Mezouar looked desperate in trying to win over sympathy and become the next Head of Government. He played on all chords: progressive, centrist, even populist, with a pity line that “[his] retired father received only a 400dhs pension” but got caught when a retired from the audience challenged him on raising the minimum pension for a population that suffers most from inflation- he shrugged it off by stating Pension Funds do not fall within government purview. But at the bottom of his beliefs -if he’d ever had any- his policies can be seen through the not-so-clever web of words: downsizing government, cutting taxes for the wealthy and leaving pensions funds to themselves. He did not seem remotely interest in social issues, and on those areas the elected executive has a clear mandate, he is likely to be pushed by the most conservative elements of his coalition to the right. 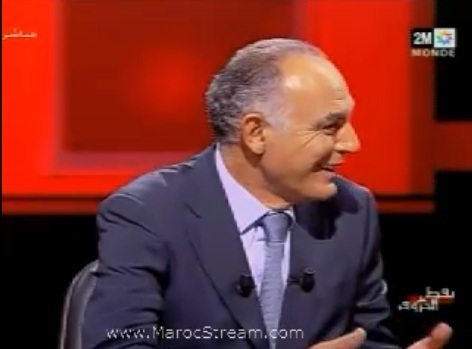 Overall, his performance, for those with a keen interest in Moroccan politics has been abysmal: he looked tired, he did sound genuine; as a regular tweep (twitter user), I was half-surprised his party’s twitter feed and his supporters did not spin his performance – there was nothing to spin. And that man might well be the next Head of His Majesty’s Government: Bland, with no substance, and no motive but to reach the top of the greasy pole. Why is parliament doing such a poor job in scrutinizing government? The image of a hilarious Rep. Yasmina Baddou and Health Minister embodies the symbol of the degree of contempt the elected executive holds parliamentary oversight. True, many of our representatives might be utterly incompetent and generally corrupt, but as long as the bulk of members of parliaments are elected on the basis of family ties, or because of their notability status, ministers and governmental officials can always laugh away from accountability. First off, even if a handful of representatives are keen on doing their job, they are constrained by the small budget allocated to their institution; the 2011 Budget allocate MAD 271.5 Million;In fairness, about the same amount is allocated to the lower chamber (235Mln) which means the legislative branch has an overall financial stipend of 0.17% of total Budget expenses. It still is way below the proper funding for all elected representatives to conduct proper investigative work on the executive. Why bang on the discrepancies in budget terms? Because money conditions resources and funds power and political importance: I understand parliament has aForeign Affairs, Islamic Issues and National Defence committee, and there are, among the 30-strong group of representatives, some very able, public-spirited individuals that would carry on their duties frightfully well. However, are they allocated the proper resources to scrutinize, for instance, the budget allotted to the Armed Forces? Budget Bill for 2011 funds the Armed Forces some MAD 58Bn (Art.44) but it seems our representatives do not have what it takes to exercise proper oversight on these spendings; Theoretically, they can always ask for details, convene to audition officials at the liaison ministry in charge of national defence, or even attach amendments if they deem spendings are not justified. But they don’t. Perhaps out of incompetence, or lack of proper resources to provide them with relevant information, or simply because they don’t care. The point is, the legislative branch has no mean to assert its power over the executive, and that shows primarily in its financial resources; but is it fair to equate material resources with political power? yes; whenever members of parliament need to carry out an inquiry, or set up a study on a particular issue, they need to rely primarily on the good will of administrative and executive officials, who can very well refuse to cooperate or disclose relevant information. 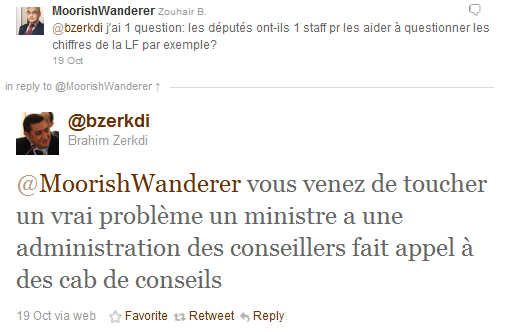 Rep. Brahim Zerkdi (who’s modern enough to have a twitter account, alongside Rep. Khalid Hariry) points out the poor level of human resources at their disposal, and goes as far as to agree that the ministries have a certain advantage in dealing with specific issues, mainly because they can afford to. 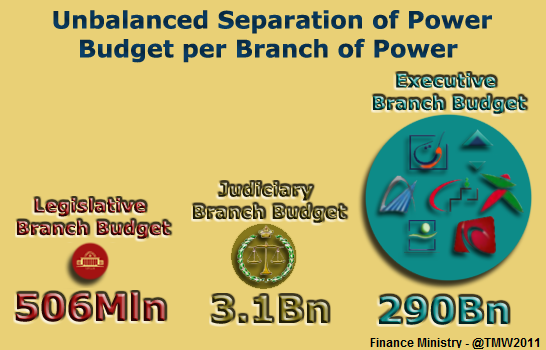 So financial support plays a crucial role in shaping up political balance of powers; the trouble for parliament is the potentially unpopular with the public opinion, and even if they try it, they will have to almost beg the money off the finance ministry. These unbalanced ties between the legislative and executive branches of government could go unnoticed or even justified, especially when one puts them into context: after all, the Treasury department in the United Kingdom is almighty, and under then-Chancellor Gordon Brown, it was an executive fortress within a Blair-led Prime Ministerial fortress. The trouble is, both Gordon Brown and Anthony Blair were elected Members of Parliament (respectively Kirkcaldy & Cowdenbeath, and Sedgefield) and thus, can claim some popular mandate on their own. Many of our ministers are not elected, though; indeed, the one holding the cash -Finance Minister Salaheddine Mezouar- has long been considered a bland, un-partisan and vaguely technocratic figure.In these circumstances, the obvious benchmark for a genuine parliamentary monarchy goes right out of the window in favour of a United Congress-like scrutiny, where elected representatives are the ones re-writing the budget -considering a government in Morocco needs a parliamentary majority. At the heart of our institutional dysfunction is this seemingly conundrum: “can we trust elected politicians with genuine political power?” Yes. So far, concentrating power within the hands of a small clique of unelected officials hasn’t done any better, and how ever incompetent the elected bunch are, they will be whipped up by public anger if they don’t carry on their job properly. The fear of systematic electoral retribution could well prove to be a much sought panacea. 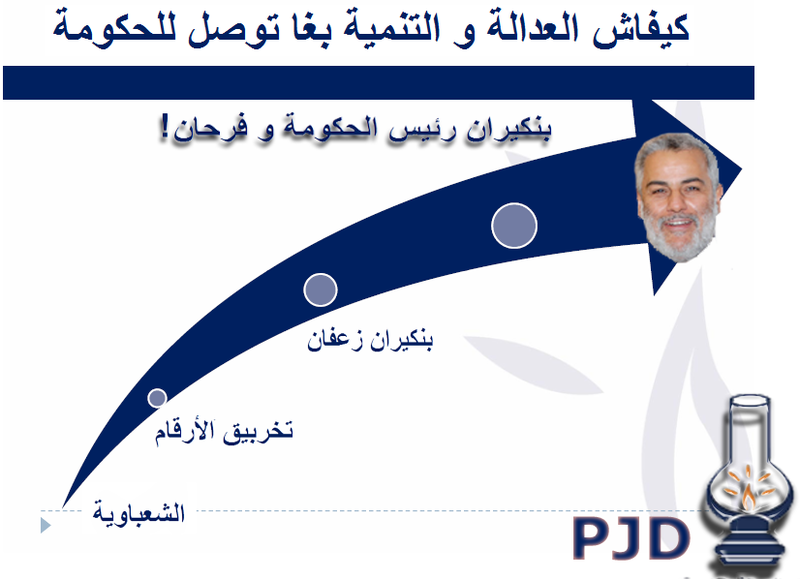 PJD unveils their electoral manifesto. A. Benkirane's party has what it takes to spin its way into office. And one sure thing: our local brand of conservative islamist politicians knows how to put on a show when it comes to presentation. 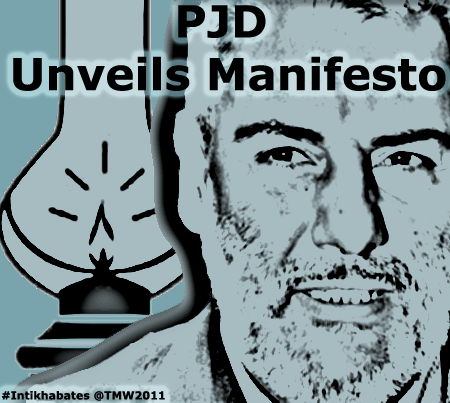 As for contents, the occasional flaws still do not disparage a robust piece of manifesto that put PJD ahead of the curve. From a presentational perspective, their manifesto is neat: nice colours, sober, elegant and straight to the point. PPS’ own manifesto, by contrast, looks amateurish and borderline insulting to those voters eager enough to seek electoral manifestos on the web. 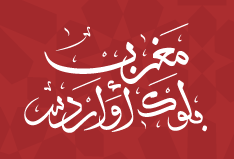 So far, PJD is the only political party not only with a pretty comprehensive manifesto on-line, but by far the most well-presented one; I am not a big fan of PJD, but I can tell when effort has been put to come up with a decent manifesto when I see one. So, Benkirane’s PJD gets top marks for their neat presentation. They also get good grades for their proposals; not that I agree with most of their policy proposals -as a matter of fact many of those are outright ideologically-driven, but they deserve credit for actually standing up for some controversial policies, instead of shooting to the moon with ill-defined, ill-funded and ill-thought policies. I cannot stress the importance of that commitment and its influence on manifesto credibility: projected growth, in essence, conditions almost every funding source a political party will tap in to carry out their policies. 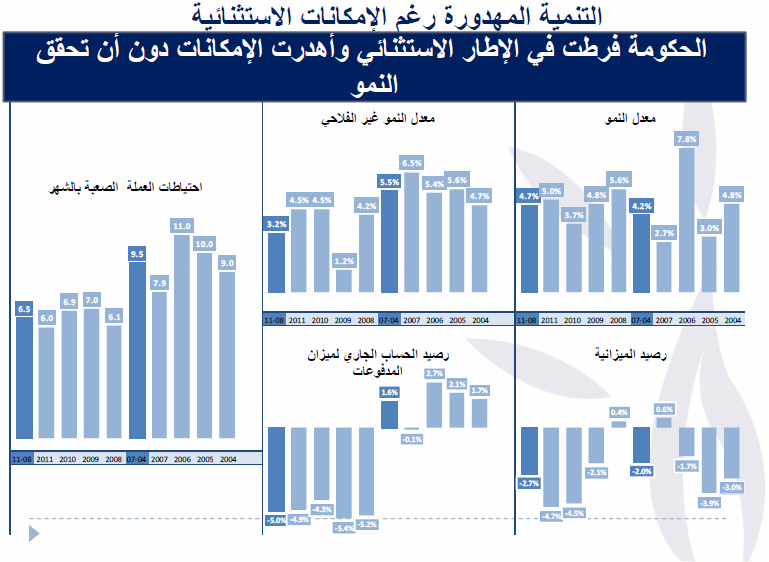 PJD projections are close to that of USFP’s to double income per capita over the next legislature, on the lower bound, since theirs is a 7% GDP growth, PJD chief economist, Lahcen Daoudi, has completely misjudged the constraints of potential growth, and the subsequent effect of this daring proposal on inflation and trade deficit. It is also worth pointing out their 2007 projection was exactly the same: 7%. the 1.5% is not enough to reach an average of 7%, but there is a chance, for a constant (or at least) investment in R&D per GDP, they can extract an average growth higher than the potential 5%, simply because research and productivity enhancement can push further output productivity. In that respect, the proposal for a 7% growth is ambitious, but buttressed with enough policy details to make it within reach; while my scepticism on the validity of their projection retains all its relevance, they seem to have put a lot of thoughts on it, contrary to other parties. But speaking of figures, PJD as not flawless in its very relevant brief summary of present ‘State of the Kingdom’, some mistakes that are either inflated deliberately, or by the negligence. 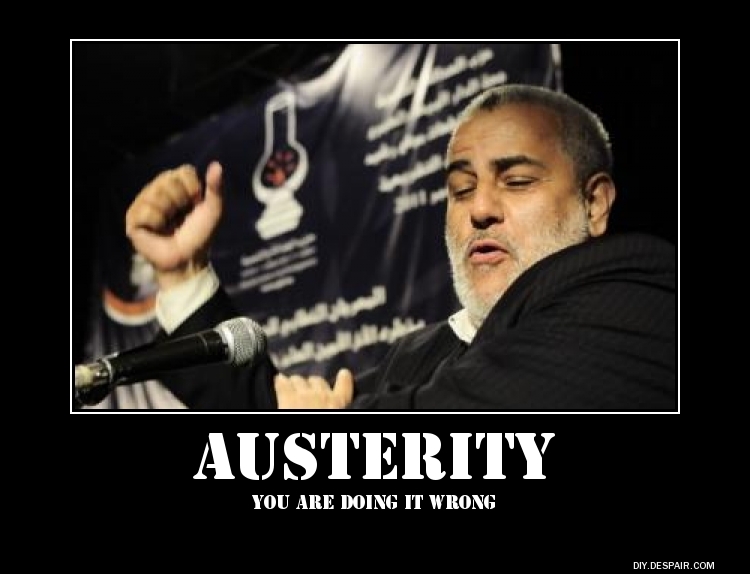 PJD Parliamentary Caucus didn't do the math well: summing up the wrong type of figures. Slide 10 computes accumulated indicators for public investments, tax receipts, and compensation fund, to name a few. But the fact is, these types of figures cannot be summed: public investment could well be accrued, but the figures -used as “yes we can” line of argument- do not take into account depreciation, nor do they distinguish those programs scrapped or introduced from one year to the other. Also, the total public investment figures they display on the charts are very confusing: the public budget law accounts for only 1/3 of these. The other goes to Hassan II and CDG funds, over which parliamentary and government oversight does not apply; it is wrong to boast they can spend MAD 160Bn when they can field at most 50. They also apply to themselves a lot of pressure on their employment policies: by committing to reduce unemployment by two basis points (basically, to 7.5% a close figure to the promised 7.7% in 2007) they mean to create more than 200,000 jobs to the unemployed alone. In fact, their commitment means they will create 300,000 jobs per annum. The guise of a seemingly small commitment to 7% unemployment rate means they are ready to embark on an ambitious venture to create 300,000 jobs to provide for both new job entries, make up for job destruction AND provide jobs for the jobless. That explains perhaps why they need that 7% growth rate. I appreciate PJD’s efforts to pile up nice figures side by side, but for those unfamiliar with the level of budget figures, those inflated numbers tend to reassure the voters that a PJD-led government has billions and billions of dirhams to spend for the promised programs, when in fact these figures are either accumulated from past years, or do not fall within the government’s purview. Finally, increasing the compensation fund is neither a good indicator of government potential, nor should it be a commitment from PJD to sustain its expenditure; the accrued trick especially sounds bizarre when it comes to that particular expenses account: the 117,6Bn are basically consumed every year. While cumulating public investment over a particular period of time (with or without depreciation factor) it is sheer lunacy to believe that subsidies should be piled on, when they are basically destroyed in the process of consumption. Lahcen Daoudi, Econ 101, perhaps? And the next slide explains the cheap (but quite clever) manipulation of figures: the percentages are computed as averages, and not accumulated as per the previous slides. Why not accumulate these numbers too? Liars? or Crooks? I understand their constituency is predominately urban, but once in government they work for all Moroccans; plus that may mean they are ready to junk any policy to put an end to the Agritax moratorium. Talk about ma3qoul… But it’s standard modern spin; as an opposition party, they have to make the outgoing government look bad by trashing its record; The trouble is, such muckraking policy does not fit the neat, bearded image they want to put up. On other policies, their pledge to raise minimum wage (Slide 17) to 3,000 per month does not specify the modus operandi of such raise, a trap other political parties fell for. That is quite fun! didn’t they know Moroccans are less prone to marry than they were a decade ago? Such a cheap shot across the Moudouwana just shows that behind the nice array of seemingly robust figures, PJD social conservative still put the emphasis on their standard vote-winner: family values, conservatism, religion and hostility to perceived Western modernity. Other than that, the proposed policies are not properly priced, and when they go into specifics, it stinks an ideological agenda: they want to generalise and subsidize Scouts movements (S.46) a notorious shuttlecock for conservative values in Morocco, and generally remain soft on law & order, but display unusual toughness on what they see as ‘morally reprehensible’. Overall, the program is pretty comprehensive; though it is back up with false or tempered figures, it has the advantage to direct criticism and debate to its content, a strong advantage that gives PJD much media coverage. But it is clear, from their policies, that they are gunning for traditional Koutla voters, and could well take them away to its own benefit. My contribution to the PJD campaign. Enjoy.